Jeff from New Jersey was in St. Simons for a business meeting in mid-October. While everyone else played golf, Jeff fished. I knew the Jacks were around. 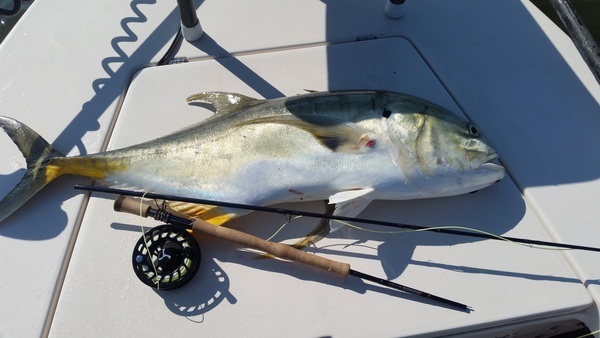 After 30 minutes of looking, and almost giving up, we got lucky and ran into several schools of huge Jack Crevalle. One hour and fifteen minutes after hooking up, Jeff brought this 27 pound Jack to the boat. 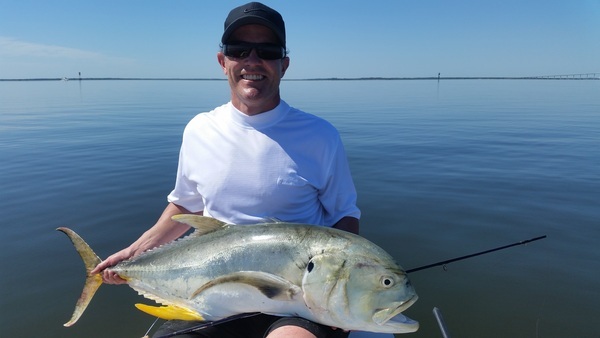 We sight fish these fish by finding the school, getting close with the outboard motor and then getting within casting distance with the trolling motor. You never know when these fish will show up. They move and migrate, so when they are here, you better go get them. They won't be around long. The end of September brought the first morning tailing tides of the year. On several mornings, we had shots at over 30 tailing fish. On a normal day, we had shots at well over a dozen fish. Clay has fished with me several times before, and we practiced casting some before we went fishing. He had shots at many, many fish, but in the grass, a number of things have to come together to connect. He caught this nice slot red fish which we tagged, photographed, revived and released to fight another day. October afternoon flood tides were terrific. Several people has lots of shots and connections. Then the morning tides of early October were a bust. Hurricane Joaquin, the super moon and another local Nor'easter pushed way to much water onto the flats. When the water is too deep, you can't see the fish tail. If the water stays warm enough, we may have some tailing fish later this week and into the end of October. As I write this, we are having Northeast winds of 25-30. While the tide isn't supposed to flood, the Northeast winds are pushing in enough water to flood the flats. When the wind dies down, I will be out checking for tails. ​As the water cools, the shrimp start moving out of the creeks, and the trout fishing heats up. Russell came for a family vacation, and spent a few days fishing. We blind cast my special chartreuse and white clouser over several oyster bars. He connected with some nice spotted sea trout. Trout fishing will stay red hot, particularly on the neap tides until the water gets cold in late December. If you want to catch trout, now is the time of the year to do it. 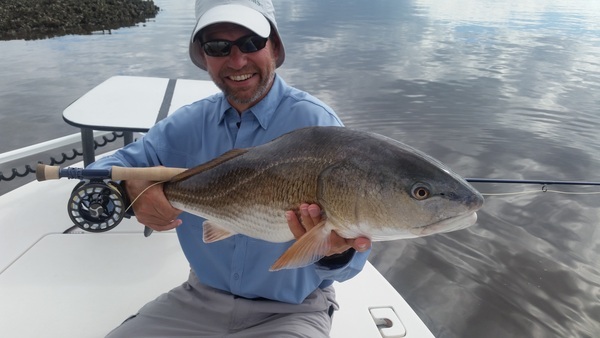 As Fall progresses, the red fishing on the low tide gets better and better. Like the trout, the reds turn on the feedbag with all the shrimp leaving the creeks. Henry came to St. Simons for a business meeting. He fished while the others played golf. The first day we had dirty water, wind and flat skies. On the second, we were blessed with fair skies, light wind and almost clear water. We pulled up to the second flat of the afternoon, and almost immediately saw fish pushing water. After several fly changes, he connected on this 31" 13 pound red fish. The fly that has been most consistent this fall is a realistic shrimp imitation tied with UV cured acrylic. See the photo in the column on the right. 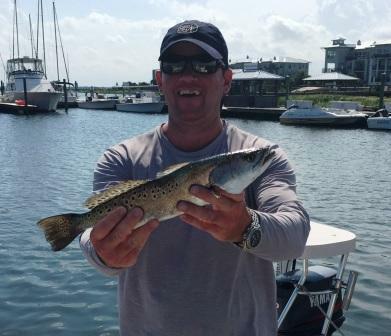 If you are going to be in St. Simons, be sure to give me a call and work in a few hours of fly fishing. 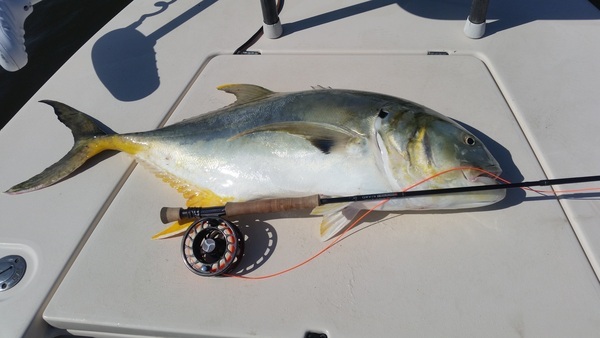 I don't often show photos of fish I catch, but the Jacks in the sound last week were thick and I had to go get them. Here are two 30+ pound fish I caught. Both were sight fished and fly caught on bunker patterns. The one in the second photo busted my 11 wt. I have been guiding now for seven years. I like to say I have been doing it long enough to know what I am doing, but not so long to think I know everything. I learn something every time i go out, many times from my clients. My good friend and client, Tim from NC, is a great fly tier. He introduced me to ultra realistic shrimp patterns tied with UV cure acrylic a few years ago. 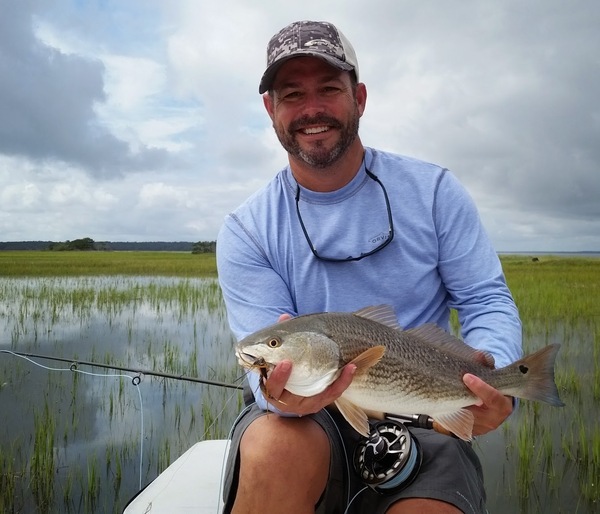 In the fall when the reds are feeding on shrimp, I have found this type of pattern performs well while fishing for the sometimes finicky low tide red fish. The photo above is of an ultra hair shrimp that I use for triple tail in the Spring, and for trout and red fish all year long. Tim ties a different type of ultra realistic shrimp fly. Here is a link to a video he made on how to tie these flies. I published this about a year ago, but it is worth revisiting. Video of tying an ultra realistic UV resin cure shrimp. These flies have been a consistent producer for me for the last twelve months. Tie and try some yourself. You will like them. Orvis encourages customers to leave feedback on their guides. I do my best to make your trip OUTSTANDING. If you feel you cannot rate me well, please let me know, and I will make it right. Please check out my feedback. Click on the endorsed guide logo. You will be taken to my website page, Reviews and Testimonials. Fall is here. While the weather is cooling, the fishing is becoming red hot. We have another round of flood tides coming at the end of October. If the water is still warm enough, we should see some tailing fish. This is the time of year the low tide fishing heats up. It is not unusual to see schools of 10-20 fish pushing shrimp as they move across the flats. As the winter wears on, the size of the schools increase. I think the biggest fish of the year are caught in November. Trout fishing is at its best in November. It is not unusual to catch a trout on every cast. Throw a DOA or a live shrimp under a popping cork and hold on. Or throw a realistic shrimp imitation or chartreuse and white Clouser minnow and pull it slowly along. When you feel a tap, tap, tap---strip strike. This is the back window of my Silver Toyota Tacoma truck. It is pretty much unmistakable. If you see me riding around St. Simons or anywhere else, stop me, say hello and let's talk Fly Fishing.